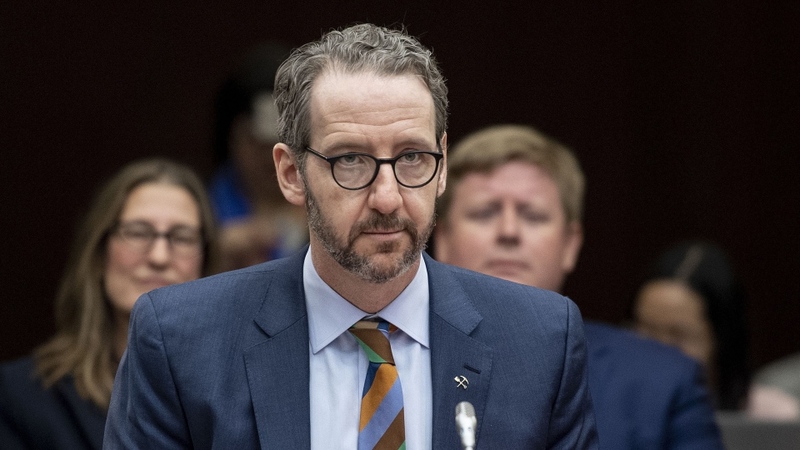 OTTAWA -- Gerald Butts, the former principal secretary to Prime Minister Justin Trudeau, says he is confident that “nothing happened” outside the normal scope of government business in regards to the SNC-Lavalin case, and that he can’t see how his or others’ interactions with Jody Wilson-Raybould on the file could constitute pressure. On Wednesday, Butts delivered just over two hours of testimony before the House Justice Committee on the ongoing scandal. The opposition tried to have him testify under oath, but that was voted down by the Liberal majority. They also sought to invite Wilson-Raybould back for a second round of questioning to allow her to speak to what have become two parallel versions of events. She again referenced the Order in Council that waived solicitor-client privilege for her to speak to the committee, and to the federal ethics commissioner who is investigating, as limiting her from speaking publicly or in any more substance about her experiences beyond her time as attorney general. Her perceived limitations based on this Order in Council appears to be incongruent with Butts’ interpretations of it based on the details in which he spoke to during certain points of his testimony. “There are stark contradictions and one of them isn’t telling the full story and we need to find out which one it is,” said Deputy Conservative Leader Lisa Raitt following Butts’ testimony. Butts did not speak with reporters before or after his appearance. After both sides of this affair have been presented before the committee, Trudeau will address the controversy publicly on Thursday when he appears at 7:45 a.m. in the National Press Theatre. This comes after he huddled with senior staff in his office this week to consider next steps in attempting to manage the ongoing scandal, including the possibility of delivering a message of contrition. This mulling of a message shift could be towards remorse or accepting responsibility over how the affair was handled. It comes after weeks of Trudeau maintaining that he and his staff did not act inappropriately in relation to the SNC-Lavalin case, and on the heels of Jane Philpott's sudden resignation, which prompted questions to all other cabinet ministers about their confidence in his leadership. In his opening remarks, Butts said his evidence shows that what happened “is very different from the version of events you heard last week,” when Wilson-Raybould, former justice minister and attorney general, testified. He requested to testify after watching Wilson-Raybould's hours-long appearance last Wednesday, in which she alleged that she faced high-level "veiled threats" and "sustained" political interference from nearly a dozen senior officials between September and December 2018 -- including Butts – to seek a deferred prosecution agreement for SNC-Lavalin, which is facing bribery and corruption charges over business dealings in Libya. “I am firmly convinced that nothing happened here beyond the normal operations of government,” Butts said. He said he hopes this “sad episode” can be resolved quickly so that the Liberals can return their focus to governing in the final year of their mandate. Butts said he believes that many of the 11 people Wilson-Raybould named last week heard for the first time through her testimony that she thought their actions were improper. He also said that he was not aware that Wilson-Raybould considered her mind made up on the case as early on as she had said. “My understanding … is that the attorney general’s power to direct the DPP extends until the time a verdict is rendered. My further understanding is that the attorney general is free to accept new advice until that point,” Butts said. Butts posed, that if this entire affair was criminally wrong, as the opposition has alleged, then why did it not become an issue in the months that discussions were ongoing. Butts resigned as Trudeau's top adviser on Feb. 18, denying any wrongdoing in the affair and stating his intent to defend his reputation. “It is one thing to be accused of something on the front page of the paper. It is another to be accused of it by a friend and a cabinet minister. One happens all the time; the other had never happened to me before,” Butts said, referencing the initial Globe and Mail report citing unnamed sources alleging that Wilson-Raybould was pressured by the PMO on the SNC-Lavalin case. As he testified, his wife Jodi Butts was among those sitting directly behind him. Butts said he takes responsibility for what he calls a breakdown of trust between Wilson-Raybould and the prime minister, and cited her being shuffled out of the justice minister role as the flashpoint for this ongoing affair. He said that there was no malice directed at Wilson-Raybould but that the breakdown of the trust between her and Trudeau may have belatedly coloured the interactions on the SNC-Lavalin case. He told the committee that the January cabinet shuffle was solely prompted by Scott Brison’s resignation, and that Trudeau tried to talk Brison out of leaving. Butts said that when it became clear they couldn’t change his mind they tried to make it as “tidy” and small shuffle as possible. The plan was to move Philpott to fill Brison’s role at Treasury Board, have Wilson-Raybould take on the key Indigenous services role that Philpott had, and then bring in David Lametti as justice minister. Butts said Wilson-Raybould turned down this offer to “pitch in,” saying she couldn’t take the Indigenous services portfolio because she was opposed to the Indian Act, which prompted her move to veterans affairs. He said he advised Trudeau that allowing her to stay in justice after refusing to move would have set a bad precedent for cabinet management. He said that after speaking with Philpott about the shuffle, it was raised to him for the first time that Wilson-Raybould may view the shuffle as a demotion, related to her intransigence on the idea of a deferred prosecution agreement for SNC-Lavalin. Wilson-Raybould has said that she believed she was being shuffled for not seeking remediation in the SNC-Lavalin case, something Butts denied. Philpott, a close friend of Wilson-Raybould, resigned from cabinet on Monday, saying that she had lost confidence in the way the government is handling the scandal. “The January cabinet shuffle had absolutely nothing to do with SNC-Lavalin. In fact, I spent at least as much time attempting to prevent the shuffle from happening as preparing my advice for it,” Butts said. He said that in all texts and emails he has between himself and Wilson-Raybould, there was no mention of improper conduct from Wilson-Raybould on the SNC-Lavalin file, until she was shuffled. Butts said he is confident that the terms of the waiver of solicitor-client privilege and cabinet confidence in this case allows him to speak about the days leading up to the shuffle, which is something Wilson-Raybould did not speak about during her testimony, citing the same waiver as limiting her ability to do so. Butts said that all they ever asked Wilson-Raybould to do was consider an independent legal opinion, perhaps from a former Supreme Court justice, and that despite what some have inferred, he does not have an opinion on whether or not SNC-Lavalin should receive a deferred prosecution. The mechanism was added through a budget bill in 2018 after heavy SNC-Lavalin lobbying, and has never been used in Canada. He said that through the entire process it was clear to everyone involved that in the end, the decision whether or not to instruct federal prosecutors to drop the criminal prosecution of the Quebec construction and engineering company, was Wilson-Raybould’s alone. Butts also said that Trudeau gave direction to his top aides, that through the entire process, they were to keep in mind the thousands of jobs that would be at stake if SNC-Lavalin was found guilty and potentially not eligible to apply for federal contracts for a decade. “The fact that the company involved employs so many people across the country heightens the importance of the matter. That was the entirety of our advice to the attorney general which we made clear she was free to accept, or not,” Butts said. But during questioning from Green Party Leader Elizabeth May, Butts said he could not recall a specific study being done at the government level, in terms of the actual economic or employment impact there would be to SNC-Lavalin if it was not granted a deferred prosecution agreement. Butts started his appearance by going through the series of phone calls, meetings, and other communications that Wilson-Raybould mentioned, based on his own notes, records, and recollection. The opposition also sought to have Butts provide all relevant emails and text messages that he referenced, to the committee, but the Liberals defeated that request. Butts said that he was unable to provide the messages and has just been granted access to them through his lawyer, after he left the PMO because he was no longer in possession of his work phone. He spent about two hours in front of the committee. His appearance was a rare occurrence for someone who has played a key backroom role for the first three years of Trudeau's mandate. “Are you aware of any instances in which the former attorney general raised this issue of pressure with the prime minister?” asked Liberal MP Randy Boissonnault. “I am not, no,” Butts replied. “At any point did the former attorney general raise the issue of pressure with you directly?,” the Liberal MP asked. Among the interactions discussed Wednesday morning was a text conversation Wilson-Raybould had with her then-chief of staff Jessica Prince about a meeting Prince had with Butts and Trudeau's Chief of Staff Katie Telford. Wilson-Raybould quoted her staffer as telling her that Butts allegedly said: "Jess, there is no solution here that doesn't involve some interference." Butts said he has a “very different recollection of that meeting” and that the comments made by Telford about not wanting to discuss legalities were taken out of context. As well, he offered his take on a meeting that both she and Butts sought at the Chateau Laurier, where Wilson-Raybould says she raised how she needed staffers to stop talking to her about the SNC-Lavalin case as she had made up her mind, and he said that she needed to find a solution. Butts said he has no recollection of her asking him in that meeting to tell any staff to stop contacting her about this matter. "I am fully aware that two people can interpret the experience of the same event differently,” Butts said. Outside the committee, NDP Leader Jagmeet Singh said that “in no way” did Butts’ testimony answer the outstanding questions on this scandal. He restated his desire for an independent public inquiry. Butts is a longtime friend of Trudeau and has been by his side since he helped the Liberals get elected in 2015. Prior to that both he and Telford had careers at the Ontario legislature. Opposition parties had been calling for Butts and others to testify for weeks before the Liberal MPs on the committee agreed to call him as a witness. Trudeau told reporters on Feb. 28 that the last time he had spoken with Butts was two days after he resigned "to check in on my friend and see how he was doing." During his testimony, Butts said that he has not spoken to Trudeau since then, and that it is the longest he has gone in 30 years without speaking to him. CTV News has confirmed that after Philpott's sudden resignation, prompting questions to all other cabinet ministers about their confidence in his leadership, Trudeau is considering next steps in attempting to manage the ongoing SNC-Lavalin scandal, including the possibility of delivering a message of contrition as early as Wednesday evening. This mulling of a message shift would be towards remorse or accepting responsibility over the affair and how senior staff interacted with Wilson-Raybould. It comes after weeks of Trudeau maintaining that he and his staff did not act inappropriately in relation to the SNC-Lavalin case.